As I said yesterday, it is a long weekend in NZ and so I want to take the opportunity to clean-up my Wargaming "Dunn-geon". The first part of that is to maximise my storage so that I can get stuff off tables and cabinets. 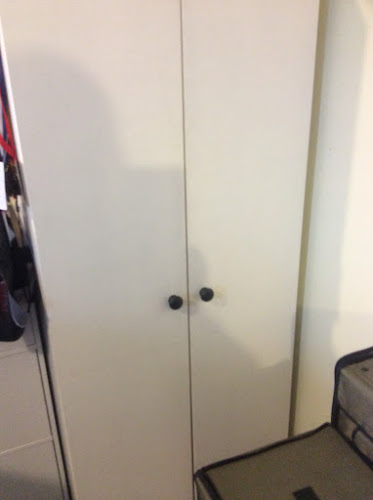 I have an old cupboard in the corner which just gets stuff shoved in it. So I thought I would see if I could get more use out of it. You can see it is pretty inefficient. So out with the trestle table and the jigsaw. 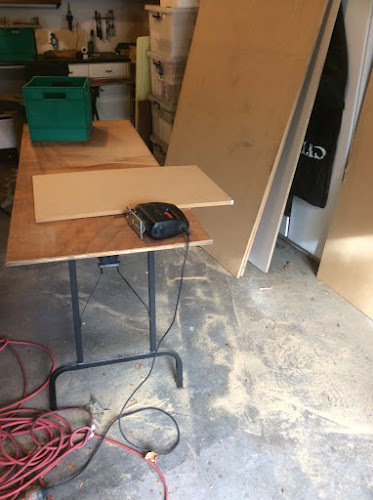 I grabbed one of my thinner mdf boards and cut it up into four new shelves. Then with some new shelf holding lugs and the drill I started adding new shelves. Proof of concept. 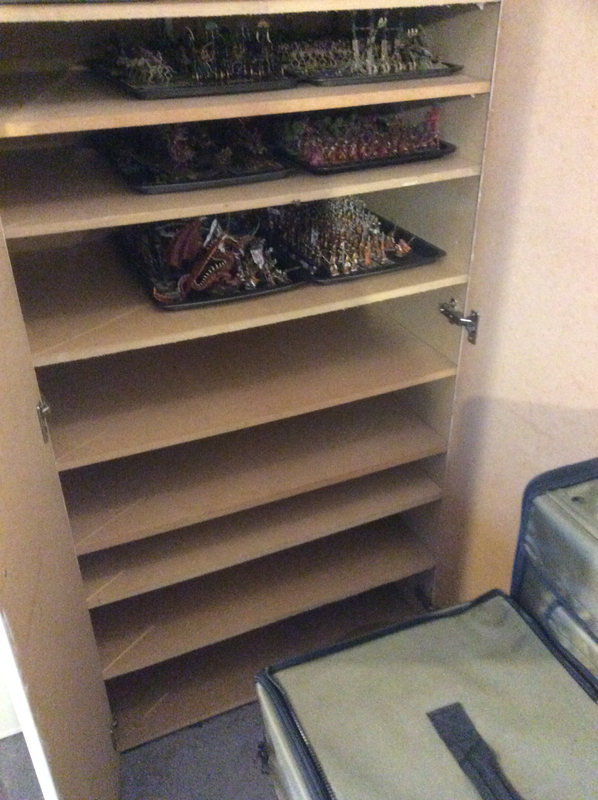 New shelves in and armies on cookie trays in situ. 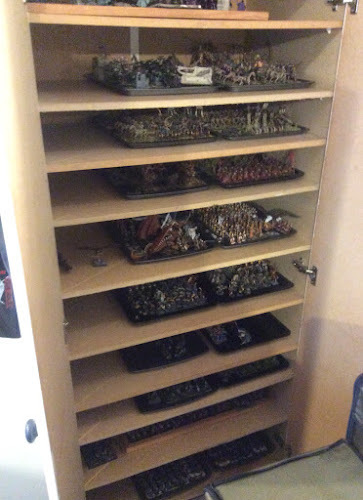 And more get added so by the end the cupboard has nine shelves and can accommodate my Vampires, Tomb Kings, Wood Elves, High Elves, Lizardmen, Empire and Orcs & Goblins. The good thing is that with a bit of thought I was able to set the shelf heights so the bigger models - Dragons, Arachnarok, Stegs, Warsphinx and standards can be easily slid in with no chance of damage. 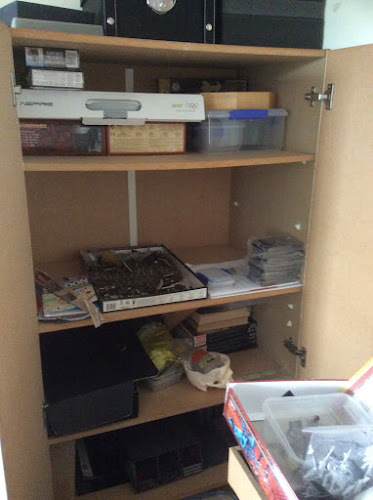 The only problem is that there is some dead space, so I'm off to The Warehouse to see if I can get some thinner trays for the end. 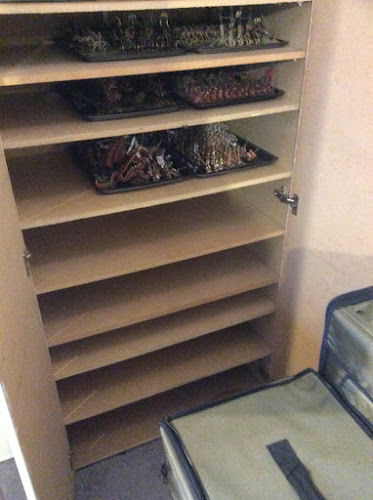 Here it is with doors closed so the armies can hibernate until it is safe....perhaps 10th Ed....to come out. Not a bad afternoon's effort. Now I have to clean up the rest of the room. Agreed. You never want to be using the term "pancake" for anything other than a meal. Good point guys. I'll add some foamcore spaces between the shelves. Nice work, handy to have them all ready to go.